Jack Fellows Hand Signed and Numbered Limited Edition Print on Paper: "Bats out of Hell"
About the Artist:On 6 April 1945, 499th Bomb Squadron, 345th Bomb Group pilot Lieutenant Francis Thompson dove his bat-nosed North American B-25J Mitchell toward an IJN Kaiboken-class frigate, Coast Defense Vessel No. 134, in the Formosa Strait 30 miles southwest of Amoy. 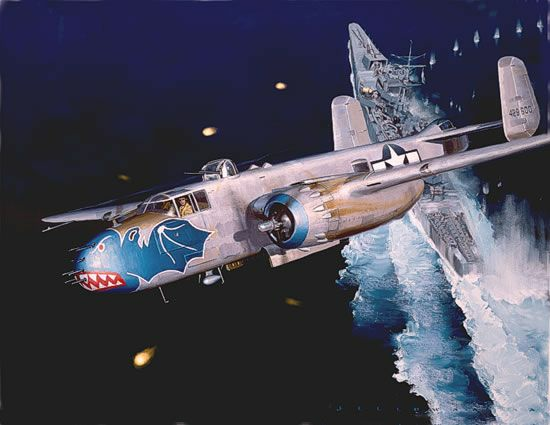 Thompson, piloting one of 24 B-25's managed only to strafe in this low altitude, mast-height, daylight attack as he was crowded out by his wingman who scored a near miss and did probable damage to the frigate's stern, and by the explosion of a delay-fus 500-pound bomb that had been dropped by the flight leader. Here Thompson pulled out of his attack in the fast and furious battle-a harrowing example of the dangerous missions that took the lives of 700 men from the four squadrons of the 345th.